Die Co. compression rings ensure a snug fit in knob-to-shaft assemblies. Die Co. compression rings provide secure, even tension between knobs and mating shafts. Made from spring steel, they ensure a snug fit even when knobs are changed. They easily expand to attach to knob hubs. Compression rings also can serve as a shim, compressing to securely hold a tube when it is inserted in a panel. 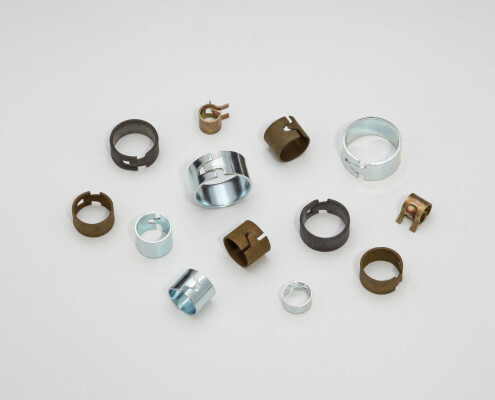 Browse the selection of Die Co. compression rings in our product catalog, contact us to customize a compression ring for your application or check for a competitor part on our cross reference list. Learn more about Die Co. compression rings and and find part numbers in our product catalog or check for a competitor part on our cross reference list. Email a Die Co. representative – or call 440-942-8856 – and tell us what you need. One of our fastener experts can help you find or design the best compression ring for your application.